Over the last few years, there has been an increasing popularity of keeping frogs as pets. The African Clawed Frog is no exception. Although a little less interactive than non-aquatic frogs, they are a joy to have if you truly want a frog for a pet. Unlike tree frogs or toads, African clawed frogs are aquatic. That means that stay in the water all the time, and come to the surfaced to breathe. Widely used for in scientific experiments, Xenopus have bread domestically for years. They were used for human pregnancy tests before more modern methods came into play. 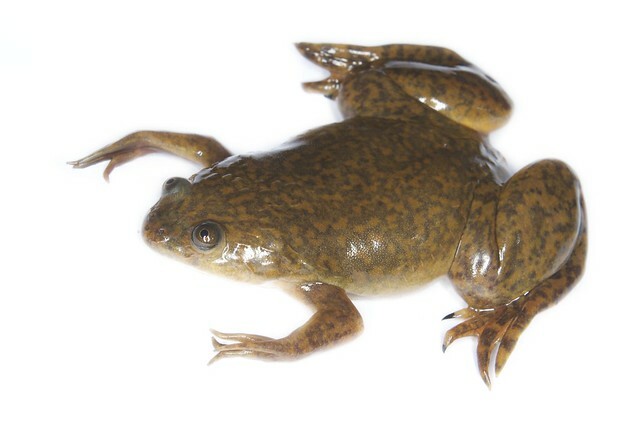 The female Xenopus was exposed to the urine of a woman, and if the frog laid eggs the woman was pregnant. Today you can find African Clawed Frogs in many pet and discount stores including Wal-Mart. They are usually small when purchased, but can grow to be five inches in length. Some females have been reported to grow up to eight inches. These frogs have healthy appetites and will consume almost anything in the tank. If they can get it in their mouths, they will eat it, including fish or other animals. They will even eat live aquarium plants. You can purchase specially formulated frog food at many pet stores or online. If you do not have access to frog food, they will eat floating goldfish pellets or shrimp pellets . An occasional treat of ghost shrimp or small fish is nice, but should not be considered a staple. They will also eat worms. A big juicy night crawler cut into a couple of pieces is always welcome. Since these frogs grow at a rapid rate, an aquarium of at least ten gallons is necessary. You may want to choose large rocks instead of gravel for your aquarium. There is a chance that gravel could be ingested and cause an impaction problem. A filter is not mandatory for frog tanks but may help to keep the water cleaner. You may also want to do partial water once a week to ensure water quality. Always keep a cover on your frog tank, because these frogs are great jumpers. If your frog were to jump out and be left unattended for an extended period of time, it would die. Their skin will dry out relatively quickly. With the right equipment and some tender loving care, you frog will make an excellent pet for years to come. There are some reports of these frogs living for 20 to 25 years!